Configure full SSL VPN with Citrix NetScaler 12 in CLI and optimize the configuration to get an A+ on Qualys SSL Labs. In this article, we will setup a full SSL VPN configuration with Citrix NetScaler 12 VPX (1000) using only the command line and we will optimize this configuration to follow the best practices from Citrix in order to get an A+ rating from Qualys SSL Labs. NetScaler (12.0 at least) configured (For this lab, we are going to use the NetScaler HA pair running NS12.1 48.13.nc firmware. You can take a look at this article Lab: Part 6 – Configure NetScaler 11 High Availability (HA Pair). Public SSL/TLS certificate imported in the NetScaler configuration. Root and Intermediate certificates must also be imported and chained properly. In this post, VPN access will be restricted to users members of an AD group (cn=vpn_users,ou=groups,dc=citrixguru,dc=lab). Connect to your Citrix NetScaler via CLI. Note: you can reuse one if you already have this configured. I published a post on this blog to configure LDAPS with NetScaler, see Lab: Part 18 – Secure LDAP (LDAPS) load balancing with Citrix NetScaler 11. At this time, the VPN should already be working but we will do some optimizations. You don’t need to type that during the configuration. set ssl vserver vsng-vpn -dh ENABLED -dhFile "/nsconfig/ssl/dhkey2048-vpn.key"
The configuration above should give you an A+ on Qualys (July 2018). I will do this step with my Android phone and from the website. Go to the Store and download Citrix SSO (Android) or Citirix VPN (Apple Store). Note: here I am using a different port for the VPN. I added a new NAT rule in my router to redirect port 3000 to my virtual server IP port 443. Click Save and connect to the VPN. You will be prompted to enter your credentials. Then the VPN session is connected. You can take a look at the stats to confirm that you are connected. Or go to whatismyip.com from the device to confirm that the IP is from the VPN host. Go the the VPN url and logon. 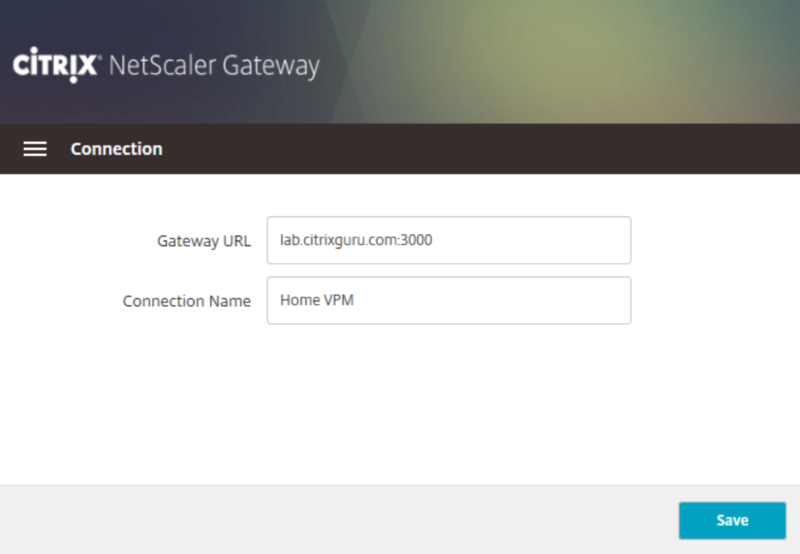 The website will check if NetScaler Gateway Plug-in is installed. You can also download the plug-in here: https://www.citrix.com/downloads/netscaler-gateway/plug-ins/netscaler-gateway-plug-in-clients-v121-4813.html. Then, Chrome will prompt you to be able to detect that the VPN session has started. Note: you may have to reboot to finish the install. Once connected, you will be automatically redirected to the homepage configured in the VPN session profile (citrixguru.com). You can also connect to the VPN without going to the website. Just open NetScaler Gateway plug-in. You can click on Home page to be redirected to the homepage configured in the VPN session profile (citrixguru.com). By default, no automatic redirection in this case. That’s all to configure a full SSL VPN in NetScaler with the CLI. I hope it helped. Cheers.